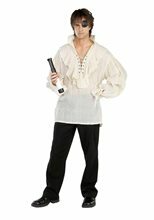 Captain Cruise Adult Costume.Includes: Jacket, Pants and Adjustable Hat.Available Size: Mens - Standard. (See Size Chart For More Information)*Shoes Not Included.Costume includes jacket with epaulettes, brass tone buttons and career decoration, elastic waist pants and adjustable hat. Great item at a great price, available in one size only. Measurements follow: Chest under arms measures 46 inches, shoulder at top of sleeve to cuff measures 25 inches, jacket measures 29 inches from shoulder at neck to hem. Pant waist expands from 28 to 42 inches, the inseam measures 29 inches and the pants measure 42 inches from the waist to the cuff. Pirate Skeleton Adult Costume.Includes: Skeleton mask with attached bandana, hair and eye patch, and skeleton gloves.Available Size: One Size Fits Most Adults.Material: Polyester.Care Instructions: Hand Wash.*Shoes, Pants and Weapon Not Included.Create the same scary scene for your next Halloween or costume party with this Pirate Skeleton. Includes a brown shirt with rust colored sleeves, Skeleton mask with attached bandana, hair and eye patch, and skeleton gloves. 3-piece set. Polyester. Hand Wash.
Deluxe Death Do us Part Men Costume;Two sided latex mask with vampire man face as the front and vampire lady face on the back with attached faux hair. 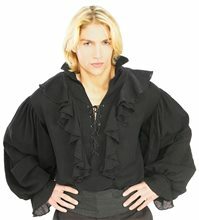 Front of mask is a polyester vampire shirt with attached jabot style collar, button accents, and attached medallion in the front. Separate cape is long black velvet with a red collar accent and front tie to accent the Vampire front. There is padding in the back to help with the illusion of of the backside being the lady vampire. Back of cape has attached arms and helps to complete the vampire lady side the costume. One size fits most. Pants not included.